Vancouver, British Columbia, May 17, 2018: Sienna Resources (“Sienna”) (TSX Venture: SIE) is pleased to announce encouraging drill results from the recently completed 7 hole, 942 meter drill program at its Slättberg nickel-copper cobalt project in Sweden (see Table 1, below). Drill results from this initial drill program at Slättberg show several significant intercepts of nickel and cobalt mineralization in areas that are along strike and down dip from historic mine workings in the area. These results include 2.8 meters averaging 1.05% nickel and 1125 ppm cobalt and 0.79% copper in drill hole SIE-18-3, and 13.0 meters averaging 0.32% nickel and 340 ppm cobalt 0.28% and copper and 0.32 ppm platinum + palladium, including 2.35 meters averaging 0.87% nickel and 594 ppm cobalt and 0.35% copper and 0.73 ppm platinum + palladium in drill hole SIE-18-5. This serves as clear evidence that additional bodies of nickel, cobalt and PGE-rich sulfide mineralization exist in the area, and remain open at depth and along strike. Hole SIE-18-3 was drilled to the east of the historic Myrgruvans Mine, in an area that was previously untested by drilling. 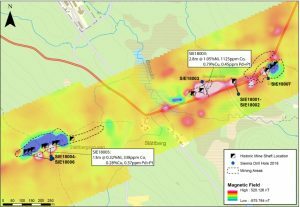 However, magnetic surveys in early 2018 showed a strong anomaly in the area, which was generated by the nickel bearing pyrrhotite-rich mineralization intercepted by hole SIE-18-3. The target remains open along strike and at depth. Hole SIE-18-4 was drilled in the vicinity of another strong magnetic anomaly, further to the west along the mining trend. Mining maps from the area showed historic workings extending to a depth of 40 m in the area. However, hole SIE-18-4 entered mine workings at 76.8 meters depth, and was lost when drilling could not continue through a stope. Thus, mining in the area continued to significantly greater depths than had been indicated by the historic records. Hole SIE-18-5 was drilled from the same drill pad as SIE-18-4, but was set back 7.5 meters and drilled a steeper angle. The hole intercepted pyrrhotite-rich mineralization 13.0 meters averaging 0.32% nickel and 0.28% copper and 0.034% cobalt and 0.32 ppm platinum + palladium (true widths interpreted to be 55-65% of the interval). This confirmed the presence of mineralization extending below the mine workings, and the likely source of the magnetic anomaly. Further, the thickness of massive and semi-massive sulfide in hole SIE-18-5, along with brecciated textures suggest that the mineralization may be broadening at depth. The target remains open at depth and along strike. Hole SIE-18-6 was intended to test another strong magnetic anomaly that lies further to the west of the magnetic anomaly targeted by holes SIE-18-4 and SIE-18-5, and likely represents an extension of that body of mineralization. However, hole SIE-18-06 deviated substantially from its intended target, and failed to test the magnetic anomaly. Thus, this target remains untested. SIE-18-5 114.7 116.2 1.5 0.29 484 0.67 0.37 TD 147.6m, Az 349°, Incl -69°, True width estimated to be 55-65%. SIE-18-5 118.0 131.0 13.0 0.32 338 0.28 0.37 TD 147.6m, Az 349°, Incl -69°, True width estimated to be 55-65%. including 118.0 124.6 6.6 0.45 500 0.36 0.42 TD 147.6m, Az 349°, Incl -69°, True width estimated to be 55-65%. including 118.0 120.4 2.4 0.87 594 0.35 0.73 TD 147.6m, Az 349°, Incl -69°, True width estimated to be 55-65%. SIE-18-7 90 90.65 0.65 0.20 250 0.25 0.14 TD 119.4m, Az 342°, Incl -57°, True width estimated to be 60-70%. The Slättberg Cobalt-Nickel-Copper Project consists of three adjacent exploration permits comprising approximately 12,733 contiguous acres.